Dexter Daily: POLL: Which Was Your Favorite Eighth Episode of a Season? POLL: Which Was Your Favorite Eighth Episode of a Season? In our latest poll, you can vote for your favorite eighth episode of a Dexter season. Season 1 Episode 8: While looking into a series of suicides of high profile, powerful women, Dexter realizes a pattern: they all saw the same shrink. Dexter goes into stalk mode and becomes a patient of the shrink to ascertain whether or not he is the killer that he seems to be. Unexpectedly, the shrink helps Dexter unlock dark secrets from his past. Debra's latest relationship with Rudy also quickly heats up. Dexter's relationship with Rita, however, seems to be in danger as Paul works his way deeper into Rita's life and much to Rita's consternation, the kids love him and he's actually civil to her. Meanwhile, Dexter's certainty that Neil Perry is not the Ice Truck Killer helps LaGuerta to decide to not just accept Neil's confession, despite mounting evidence to the contrary. Season 2 Episode 8: After a fire at Lila's place, Dexter finds her becoming more attached to him than he is comfortable with. 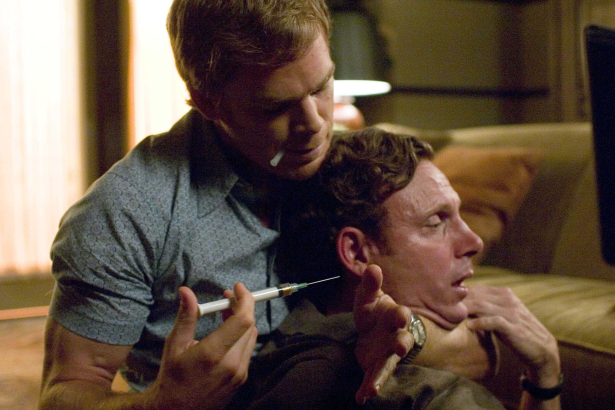 Meanwhile, Dexter decides "recovery" isn't working for him and pays a second visit to the man who murdered his mother. At the station, Debra and Lundy find a clue that points to the Bay Harbor Butcher being right under their noses. Season 3 Episode 8: Miguel brings Dexter another "project," but this time he wants to get his hands dirty. Dexter realizes it's time to teach Miguel the Code — for his own safety as well as Miguel's. As Dexter walks Miguel through the process, Dexter both struggles with, and enjoys, letting Miguel into his private world so completely. But Dexter doesn't realize that this has only whetted Miguel's appetite. Rita finds herself losing control because of the pregnancy. She becomes worried that Dexter may get fed up with her. Because of her hard work, Debra finds herself one step closer to catching the Skinner. But after she finds out a secret about her new boyfriend, Anton, he disappears on her. Season 4 Episode 8: When Dexter discovers that Trinity is planning an out-of-town trip, Dexter sees an opportunity to ride along and gain insight into the mind of a fellow monster. Even so, Dexter isn't prepared for the startling revelations Trinity makes along the way, revelations about his own past which only serve to convince Dexter of what he must do. Meanwhile, back at Miami Metro, Debra refuses to let a technicality keep her off the Trinity case. She works through others to ensure her voice is heard — that is, until she realizes that her single-minded pursuit of the Trinity Killer may have blinded her to the truth. Season 5 Episode 8: Dexter attends one of Jordan Chase's seminars and the plan is to rent a hotel room next to Cole Harmon, who is Chase's head of security, and eliminate him there. He shows Lumen how to prepare a killing room but events don't quite unfold as planned. In the end, Dexter gets a vital clue that identifies another of the men who attacked her. Lumen also has to deal with her ex-fiancé who suddenly shows up in Miami. At the station, the fallout from the shootings at the night club begins to take its toll. Debra sees the writing on the wall when Angel Batista tells her he hasn't written his report yet and is still going over what happened. She feels betrayed by an unexpected source but also gets support where she least expects it. Season 6 Episode 8: Dexter uses lessons he learned from Brother Sam to follow up on some new leads in the Doomsday investigation; Debra butts heads with Captain LaGuerta over the case of a dead call girl. Season 7 Episode 8: Dexter tries to keep Debra in the dark about his relationship with Hannah, but a surprise visit from Astor, Cody and Harrison throws a wrench into his plans. Fresh out of jail, Isaak renews his pursuit of Dexter while Quinn continues his power struggle with the Koshkas. Season 8 Episode 8: Dexter tracks down Zach, concerned that he may have murdered an innocent person. Meanwhile, Dexter tries to help Hannah escape the country. Which was your favorite eighth episode of a season?